In 1838 an Italian Professor first produced salicylic acid from the flower buds of the Meadowsweet plant. 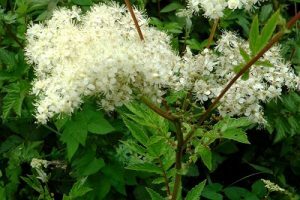 Then in 1899, a drug company called Bayer formulated a new drug (acetylisalicylic acid) and called it aspirin, a name derived from the old botanical name for Meadowsweet called Spirea ulmaria. Essential oil with salicylates (opiraein, salicin, gaultherine), salicylic acid, tannin (up to 10%), mucilage, flavonoids, Vitamin C, sugar and citric acid.